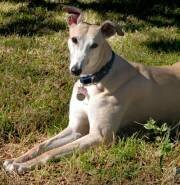 Is a Greyhound Dog Breed Right For You? The Greyhound is a breed with the tragic ability to run fast. Many Greyhound owners use their dogs to compete in races and put them down when they loose too many races. However, these dogs can also be wonderful pets and many of them are rehabilitated by Greyhound rescues. Before you open your heart and home to a displaced Greyhound, you should talk to the rescue about the problems new dog owners face. Racing Greyhounds are trained to chase down a mechanical rabbit. Unfortunately, they don't always differentiate between a rabbit and a small dog or cat. They do better as single pets. In addition, these dogs are already full grown, but are not potty trained and do not have any idea of household etiquette. The Greyhound dog breed is classified as a member of the Hound Group by the American Kennel Club. These dogs first appeared in ancient Egypt, where they were used to run down prey. When they came to England, they became common with British noblemen, who began racing them. Greyhounds traveled to America, where their owners continued this popular sport. Greyhound Dog Breed Explained in brief. Greyhounds are large, powerfully built dogs. They have long legs and narrow bodies. These dogs are all muscle. Greyhounds have dark eyes and a long, graceful tail. Unlike many other breeds, a Greyhound can be any color. Greyhounds are capable of developing an incredible speed, but they are not actually high energy dogs. In between races, these dogs are couch potatoes, conserving their energy for the next chase. They need a fenced yard so they have room to run, although dogs that live in apartments adapt to walking on a leash without too much trouble. Greyhounds are friendly, sociable dogs. They love to spend time with their family and are very playful. They like nothing better than snuggling up on the couch beside their owners all evening long. Greyhounds enjoy playing with children and are very gentle with them. They also play well with other dogs. You will need to keep a close eye on your dog if you have other pets, since the prey instinct may be too hard to resist. Greyhounds need plenty of fuel for their bodies. You will need to feed your dog a high quality dog food. However, since these dogs are prone to bloat, do not allow your dog to overeat. Several small meals are better for his health than one large meal. Consult your veterinarian to find out how much you should feed your dog at each meal. A good vitamin supplement is also a good idea for these dogs. Grooming a Greyhound is simple, since these dogs have a short, sleek coat that does not shed heavily. Brushing your Greyhound once a week should be sufficient. You may also want to trim his nails if they are tapping on the floor when he walks. Owning one of these dogs can be overwhelming at first. However, if you are willing to persevere, you can end up with a wonderful, devoted family pet for many years to come.